In Ukyo Ward in Kyoto, there is a fantastic bathouse that I absolutely love - Tenzan-no-Yu. It is probably my favourite ofuro, though it's kind of halfway between as it has elements of hot springs (onsen) as well as the elements of a spa. Unfortunately, it is so far away that any trip there becomes a big excursion. 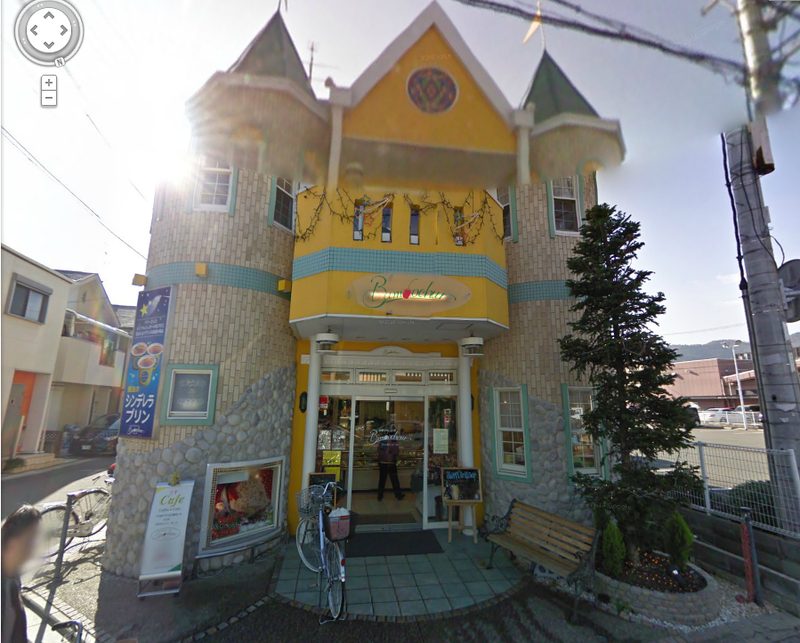 My favourite stop on my way to Tenzan is, thus, this classy little bakery a few doors down, called Bambocheur. The great thing about Bambocheur initially was that when I saw it (and as you can see, it's difficult to miss) through the bus window I knew I was getting off at the next stop. Useful when you cannot ever remember the name of the stop you want and fear you may have passed it while distracted during the 40-minute ride. 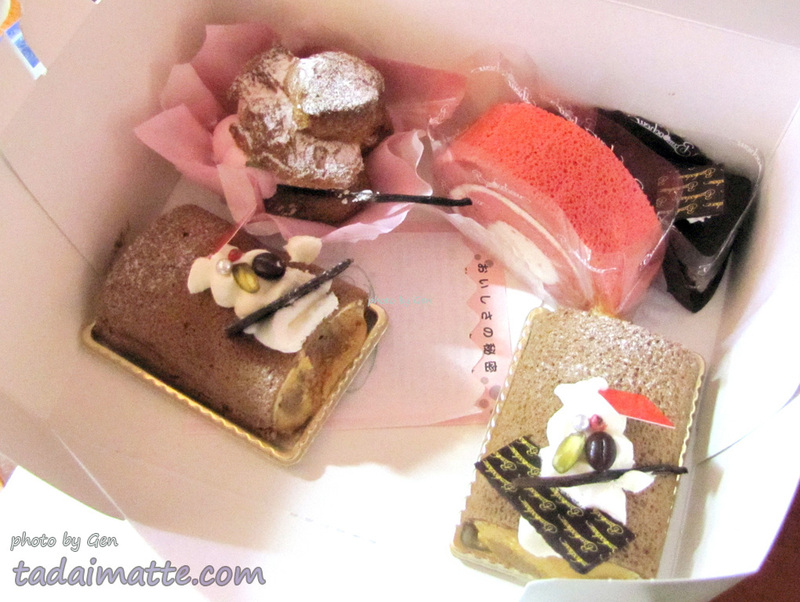 The next-greatest thing about Bambocheur is the cakes. Consider this perfect rainy Sunday - slip out of my stuffy apartment and take the train to Kyoto with a bottle of tea and some tunes in my ears. 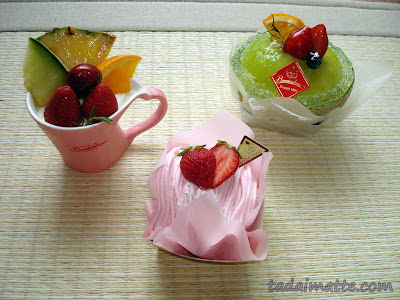 Buy the loveliest cakes I can find (top left was a pudding, top right was a melon cake, bottom was a strawberry monbran) and let the girl pack them up carefully with lots of icepacks to keep them chilled. Linger in the hot springs for an hour and drink nice cold coffee milk or fruits milk. Go home warm and happy, and photograph cakes because it just breaks your heart to mess them up. But you can't stay away so you eat them anyway. Yes. Plenty of people have criticism for Japanese confectioneries because they do tend to be less sweet than Western desserts. That's fair, since the sugar is what usually makes cakes moist. 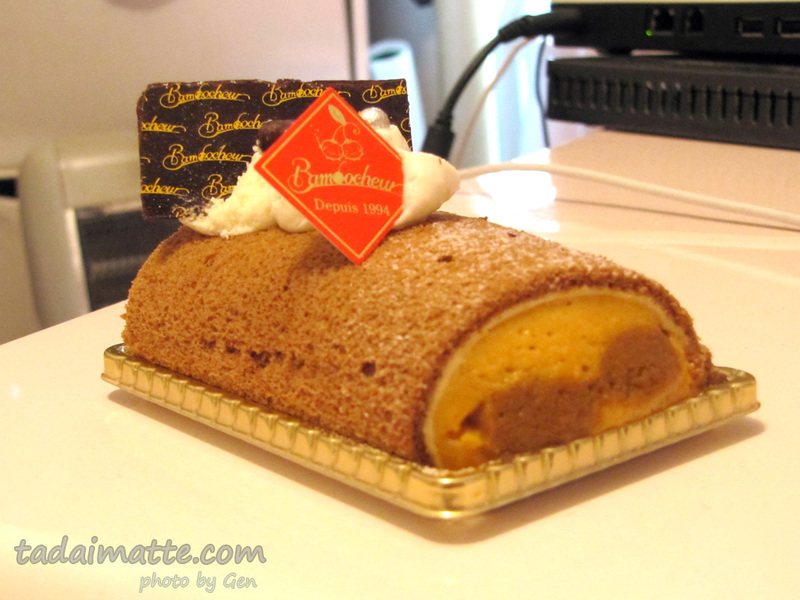 Bambocheur cakes could taste like sawdust for all I cared (and they don't!) and I would buy them anyway, because they are too too pretty.